The International Boatbuilding Training College in Lowestoft adds interest to its exhibition stands by getting students to work on a boat, and until recently their party piece was a St Lawrence River Skiff. Over many shows, they recreated the No 5 design of the old Skaneateles Boat and Canoe Company, which used to operate in the Finger Lakes region of New York State. At the Beale Park Thames Boat Show, she was exhibited finished, and Nat Wilson told me it was for sale and "she hasn't even been in the water yet". Well, that was a scandalous situation that was soon resolved. 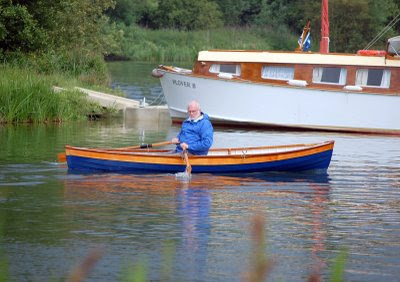 Here I am taking her on her maiden voyage, captured by the lens of Chris Perkins (sorry about the quality of the other pics - the battery had run out on my camera and I had to resort to my mobile phone). 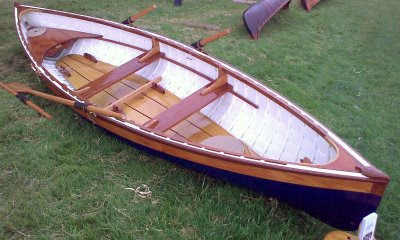 The St Lawrence River Skiff is legendary for its seaworthiness and ease of rowing. I couldn't really test either attribute in the flat calm of the lake at Beale Park, especially with the heavy, stumpy oars that were in the skiff, although Nat says he is making more suitable oars. But she slid through the water with ease and grace and she is beautifully built. This lovely boat is for sale at £4,500 and cheap at the price.